Just like that, a narrative that was as exhilarating as a wild goose chase, as Smollett shifted from assumed victim to suspect in a racist and homophobic hate crime he reported, became a shaggy dog story. It dropped off at nowhere. The cord was ripped out of the wall so hard, it snapped and whipped back in our faces. In the wake of the foot-dragging over the release of the full Mueller report, it’s been a rough week for us playing along at home. As decisive as Tuesday’s conclusion was, its essence was as ambiguous as much of what had already taken place in maybe the weirdest (and therefore, in my opinion, most riveting) pop culture story I’ve witnessed in my lifetime. Smollett would be forfeiting the $10,000 bond he paid after his February arrest. His community service (which CBS Chicago says totaled 16 hours over the past weekend) was noted by the prosecutor. He’d walk free. His lawyer Holmes, in a Tuesday morning press conference, denied that he’d forfeited the bond in exchange for the charges being dropped. “There is no deal, the state dismissed the charges,” she said. “Without the completion of these terms, the charges would not have been dropped,” said the prosecutor Magats, which sounds like a deal to me. Magats may think Chicago has better things to do than to offer the public a logical conclusion in this case that has taken up so much of its attention, but if Smollett is as guilty as Magats thinks he is, here is another suggestion that people have license to stretch the truth like taffy and poison us with their homemade sugar. Smollett allegedly did so on a national stage, a potentially immense disservice to a public that largely received with credulity his initial account of being jumped by two homophobic racists. If he’s guilty, he took us all for a ride with a cockamamie plan that I can’t even believe he thought he could pull off without scrutiny (fueled by the fumes of the potentially ensuing Twitter furor). In her press conference, his lawyer Holmes repeatedly imparted a sense of eagerness for Smollett to be able to move on with his life and career. In his brief statement after Holmes took questions from the press (and gave quite a few, “I don’t know” answers), Smollett said, “I’d like nothing more than just to get back to work and move on with my life.” Good luck with that. Whatever deal or no deal was struck or not struck, anyone capable of critical thinking can plainly see that information is being withheld. Nothing assures the public of innocence like transparency. The most reasonable theories regarding the dropping of charges and ensuing secrecy suggested that there was some sort of bungling on both sides—Smollett told a story that the Chicago PD felt it could poke holes in. Make no mistake: All sides maintain that the Osundairo brothers perpetrated what was either an attack or some elaborate hate-crime theater. At Tuesday’s press conference, Holmes’s lawyer said so. 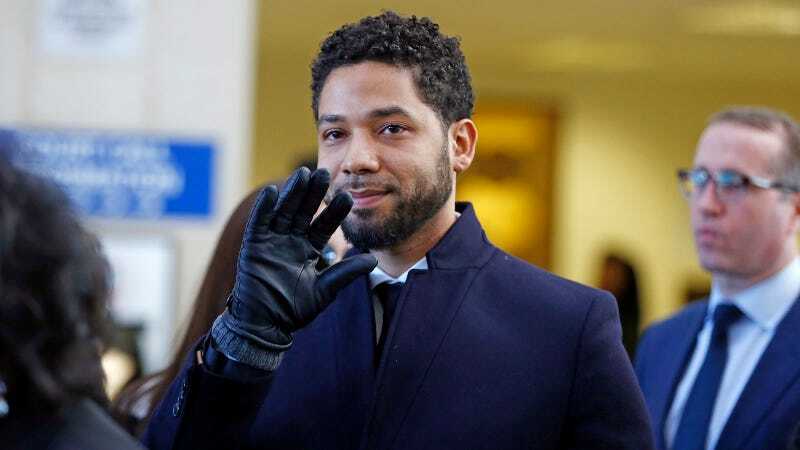 (The announcement of the dropped charges she and Glandian issued to the press earlier Tuesday morning maintained that “Jussie was attacked by he was unable to identify on January 29.”) Smollett is keen to move on, but without the resolution, he will face questions from every interviewer who knows how to do their job until he gives a reasonable account. This will follow him and haunt his public profile until his narrative makes sense. I’ve heard our contemporary cultural era described as a “post-truth” time, where public opinion carries more weight than proven fact, based partly on Donald Trump’s ability to get away with lying regularly and profoundly. Tuesday’s decision regarding Smollett’s case is post-post truth. If misinformation is hell, no information is purgatory. This makeshift ending might be some puritan’s version of punishment for not minding our own business, but how could we when Smollett flagged us down and commanded our attention in the first place. In doing so, he made us all spectators, and with Tuesday’s development, he has failed to deliver on his promise of spectacle. From this particular perspective, we have been absolutely cheated, scammed out of the scam.